When I was in a senior drawing class at Syracuse University, I was drawing a tiny little narrative series. My professor, Stephen Zaima, told me to draw my next project on very big paper. Then, he thoughtfully said, draw small on very big paper. It may have been the most esoteric direction a professor gave me in art school, but I never forgot his sensitivity. I really liked the work that came from his suggestion. So today I'm sharing some of my small drawing for SMALL. What we refer to as thumbnails. 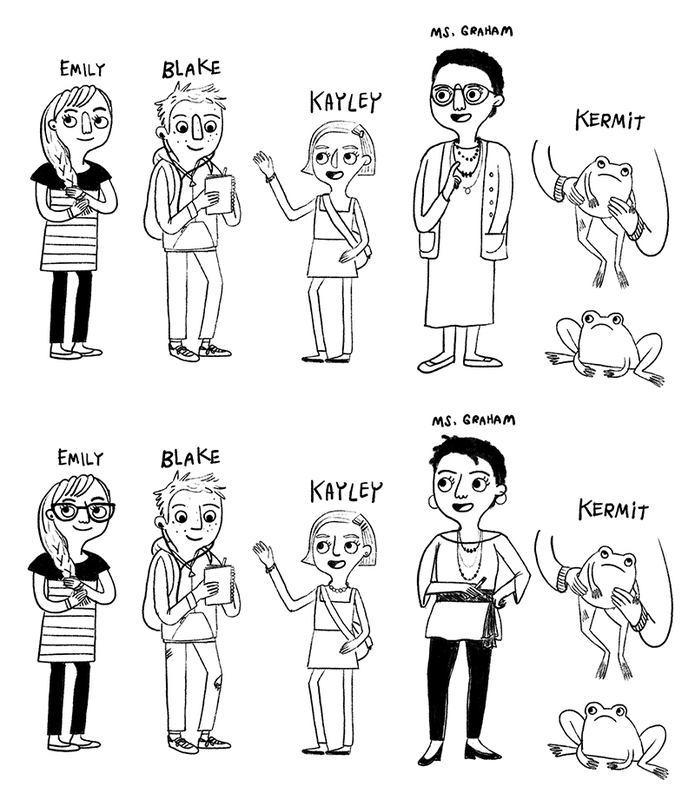 One of things I love about making books are all the different stages of work. 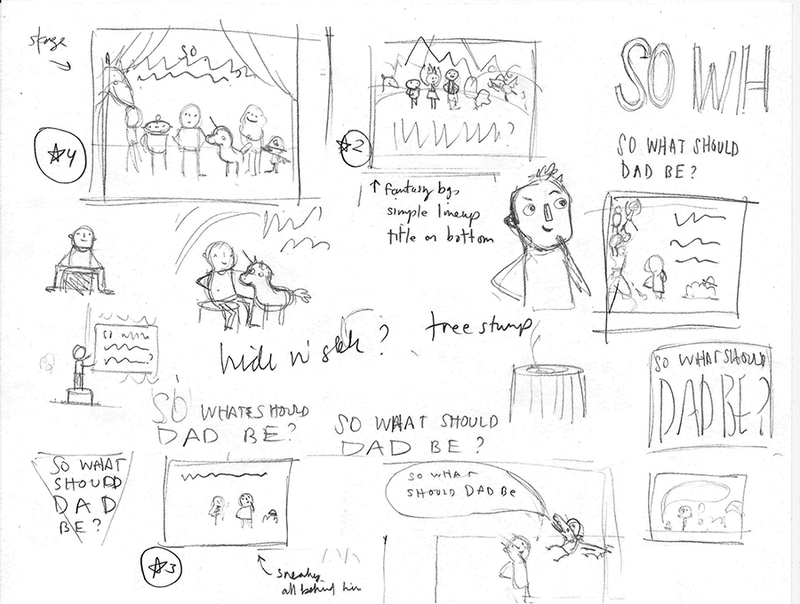 Thumbnailing might be one of my favorite stages (even though it can be full of internal angst and drama!). I love coming up with concepts in a simple, raw way. It really is the essence of emotion and story. It's awesome to look back at the last page of thumbs (above) and know that it matches the final story, even from these little bits. SMALL comes out August 1st from little bee books. You can preorder from your favorite store and download the activity kit here. I'll be sharing some blog posts about the making of SMALL. It's been a long road! Today, I'm sharing one particular spread that survived (but changed drastically) from an early version of the book. I really loved the sketch above. So much so, that I chose it as one of two spreads to paint for the completed dummy. It was a big, gouache painting that took a long time to complete. I also sent it out as a promotional postcard. 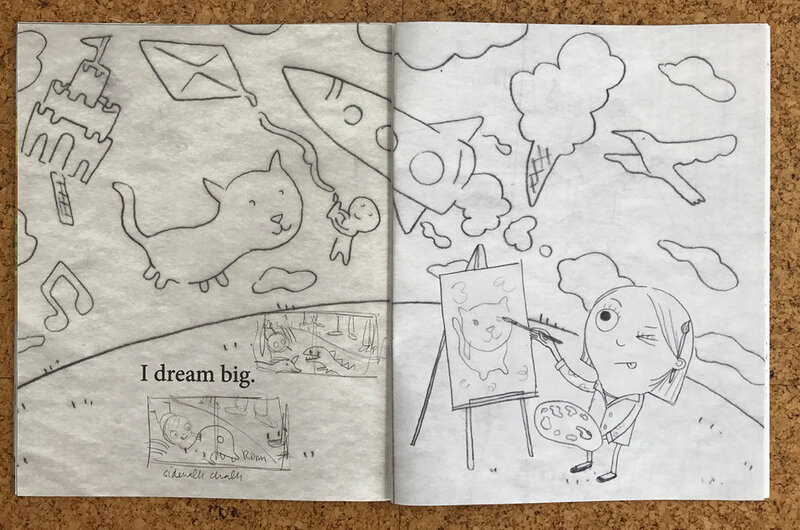 When I revised the dummy, I kept the overall concept of this spread, but so many things changed - this was the sketch I submitted and was accepted when little bee books acquired SMALL. For one thing, the character looks different, stylistically. But really, the whole scene is far more active and dramatic. She is no longer content to be small on this busy street, but a little scared and surprised. All traffic is moving in opposition to her, and we can almost hear the HONK! HONK! of the drivers. NOTE: This is the terrible, loose, messy sketch I sent when I submitted (and sold) my book. I have cringed when I have seen other artists' tightly rendered, meticulous dummies. Find a balance that is right for you! 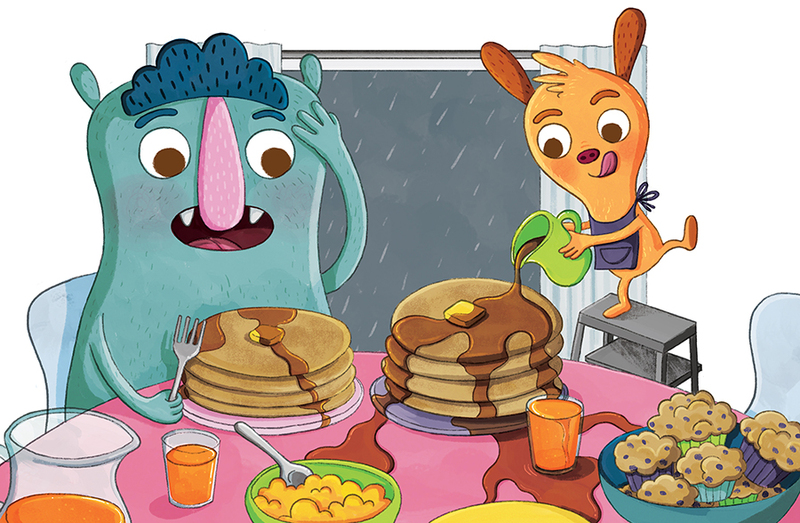 This is the final art as it appears in the book. Notice all the changes from the approved sketch? I needed to include her mother, be more mindful of the gutter, push the HONK! HONK!, etc. I have switched to working entirely on a Cintiq, and I may have spent LESS time painting this final art than the earlier example. Have I mentioned how much I love my Cintiq? When I look back, I can see just how much I benefitted from reworking and pushing my ideas. I am so proud of the final art and grateful that I had the time to mature as an artist before publishing a story that is so dear to me. SMALL will be released on August 1st from little bee books. Click here for more info about pre-ordering and the activity kit. With one week to go before the release of IT'S GREAT BEING A DAD I thought I would share the process of creating the cover. A bit nicer, right? There are things that I still really like about each concept. Having Loch Ness in each concept really added an extra challenge. She made a great base for that creature pyramid though, right? Want to see the photoshop layers fly by? Watch this video of the cover, layer by layer! You can preorder IT'S GREAT BEING A DAD on Amazon, Barnes & Noble or at your local independent bookseller (Indiebound can help!). In honor of Women's Day, I gathered the three female characters in It's Great Being a Dad for more character development sketches. With no further ado, I bring you a Unicorn, a Loch Ness Monster, and a Fairy Queen Ballerina Doctor!